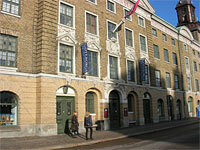 Museums in Gothenburg - both for children and adults. 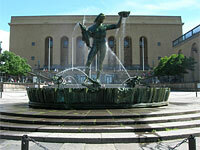 In Gothenburg you can choose from different museums and places to visit. For you that are interested in art, animals, history, shipping etc. We give you some tip about different museums and places to visit during your stay in Gothenburg. For those who want to visit 4 museums unlimited for one year, we would like to recommend a annual ticket. The annual ticket costs 100 SEK and is valid for one calendar year. 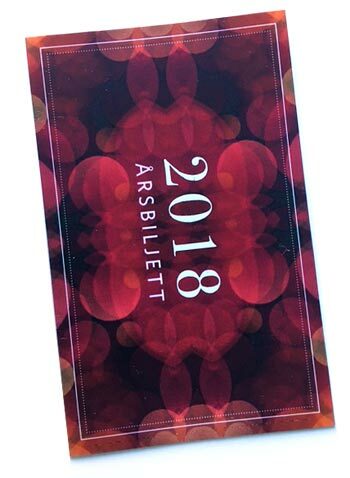 The ticket can be purchased at one of the museums included in the annual ticket: Gothenburg Art Museum, Gothenburg City Museum, Röhsska Museum and Maritime Museum and Aquarium. Sjöfartsmuseet Akvariet (Maritime Museum and Aquarium): Closed from September 2018 for extensive rebuilding. Opens again 2021. Röhsska museet: Temporary closed for renovation. Planned opening Feb 23, 2019. We give you tip about museums! This Natural History Museum is the oldest museum in Gothenburg. The Museum was built 1833. The museum was first placed inside the East India House but moved in 1923 to an own building in Slottsskogen. 1981 the museum also got some new exhibiton areas. Here you can see stuffed animals from nearly the whole world and also view an exhibition about lifes history, history about the ocean and much more. The museum is also famous for its baby blue whale that stranded outside of Askim around 150 years ago, the african elephant and the alligator Smilet that lived till 1987 at Sjöfartsmuseet. Here you also have got a café and a small shop. Located in Slottskogen near Linnéplatsen. Not far from Gustav Adolfs Torg you will find Stadsmuseet (the City Museum). The museum is located in the old premises of the Swedish East India house and the museum in it´s shape today was opened in 1993. There have been collections here in the East India house since the beginning of the 1800´s. Here you can walk around and read about the Gothenburg history and the history about the westcost. Here you can view 400 pictures from Gothenburg. You will also get the history about the Swedish East India Company, vikings, present time etc. The house itself is also something to take a closer look at, this was the centre for the Swedish East India Company between the years 1731-1813. The Museum also have a store and a café. Free entrance under 25 years. The Maritime Museum and Aquarium. was built in 1913. Here you will find exhibitions about the shipping development during 400 years and it´s Aquarium shows live environment from cold and warm waters and also have animals from sea as for example sea horses etc. 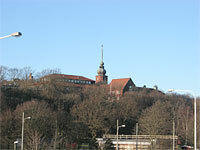 The Aquarium was built during Gotenburgs anniversary exhibition in 1923. Akvariet earlier had different animals as for example: crocodiles, monkeys, raccoon and other tropical animals. Akvariet was also famous for it´s crocodile with the name Smilet, he came her in 1923 and died 1987, probably approx 66 years old. Sorry to say that this department with the exotic animals were closed 2002-2003 due to damp and mold damage that had developed during some years. Also visit Sjömanshustrun who is standing at the top in the tower watching over Hisingen. The Museum has a café. The museum closed from Sep 2018 due to renovation. Opens again during 2021. 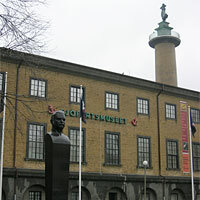 1925 this building was inaugurated at Götaplatsen as a Konstmuseum/Art Museum. Before this museum there were only some few work of arts in the East India house and this museum opened 1861 as the Goteborg museum (that now houses the Gothenburg City Museum). When the work of arts grow (there were many donations) a new art museum had to be built. The building it self were ready til the Jubilee Exhibition of 1923. In May 2017 the Gothenburg Art Museum was nominated as building memorial. Here you can among other view art by: Carl Larsson, Bruno Liljefors, Ernst Josephson, Edvard Munch, Monet, Renoir, Anders Zorn, Christian Krohg, Isaac Grünewald etc. 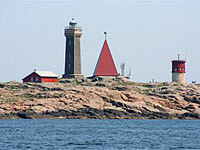 If you visit the Island Vinga during your visit in Gothenburg you can at the same time visit the lighthouse keeper´s residence who was built year 1851. The Taube family came here in 1890. Evert Taube is a famous songwriter in Sweden. His dad was a lighthouse keeper for some years at Vinga. In there house you can see pictures of the family and just feel the feeling about how it could have been to live at this small island. If it is a nice summer day, bring your swim gear and something to eat and drink. Don´t miss a visit to the lighthouse also. You can come here by boat from Lilla Bommen in the harbour. Tours depart only during the Summer. Gothenburg can be proud to have the worlds largest floating shipping museum. The museum have a lot of ships and is located beside Packhuskajen not far from Operan. 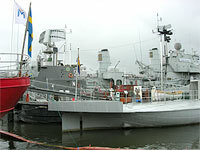 Here you can visit the old destroyer Småland and the submarine Nordkaparen. Here you also find a café and a small store. Free entrance under 5 years. Family ticket are available. When you buy an entry ticket at regular price, your ticket will become a seasonal ticket, which allows you to visit the Maritiman free of charge throughout the season. 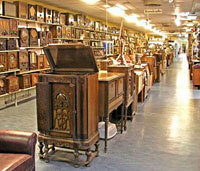 Radio Museum is the museum with radios in all its forms. On display are the broadcast radio from the very first crystal detectors to today's big stereos. Here, visitors can follow the navigation radio development from the early radios to today's sophisticated transmitter and receiver. You can view police radio, military radio, boat radio .... yes radios of all kinds and for different uses. The museum also houses a reference library with over 5100 volumes electronics manuals and radio magazines. Free entrance under 16 years. Museum a little bit outside of Gothenburg! At Arendal a bit outside Gothenburg you can visit the Volvo museum. Here you can follow the VOLVO cars development through times, from 1927 to 1990´s . The Museum is located in Volvo´s premises beside the harbour. Here you can see many different car models and if you want to shop you can visit their small store. In the museum you will also find some of Volvo Penata´s and Volvo Aero´s products. The Museum also has a café. Free entrance under 6 years. If you take the car you can park for free at Volvo´s premises. Bus: Tram 5, 6 & 10. Bus stop: Eketrägatan. Change to bus 32. 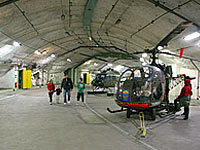 A bit outiside Gothenburg in Säve, you can visit the old aeroplane hangar from the 1950´s. During the cold war this was a top secret defence military installations. Today it is a experince centre around planes and the space. It´s really an experience to walk through the big hangar gate and after that walk down to the old path´s 98 feet under the soil. Here you can look at old aeroplans, helicopters and you can also try to sit in an helicopter if you want. Tip! bring a warm sweater, it´s a little bit chilly under ground. Bus 35 from Hjalmar Brantingsplatsen to bus stop Granhäll. With reservation for any changes.